Apart from dark matter, dark energy, black holes, and the missing-baryons of the universe, one of the most captivating mysteries in modern day physics centers on antimatter. Particularly, it focuses on the metaphorical fight between regular matter and antimatter, which were both created in equal proportions during the inception of the universe about 14 billion years ago. It’s as much of a philosophical question as it is a question of general physics. If antimatter had won out, none of our physical universe (including us) would exist, since both would have annihilated each other in bursts of pure radiation, leaving behind energy and a bright but featureless universe. So, to what exactly do we owe the extended presence of normal matter? Well…the answer to that question is difficult to answer since the conditions that existed during the millions of years following the Big Bang are difficult to speculate on, let alone thoroughly evaluate. But there is some evidence. Most of the evidence we have to dissect is in the form of the cosmic microwave background radiation (CMBR), which is a fossil of the early universe. There are also neutrinos, ghostly particles created through radioactive decays. In addition, we are able to create antimatter in a lab and study its properties to unmask some of the questions we have about the notorious nemesis of normal matter. But to begin: When trying to pinpoint an answer to our lingering questions about why matter won the war with antimatter, scientists first had to calculate an approximate percentage of the normal matter that won out over its anti-counterpart. Ultimately, they determined that there is just one extra particle of normal matter surviving for every 30 million anti-matter particles. 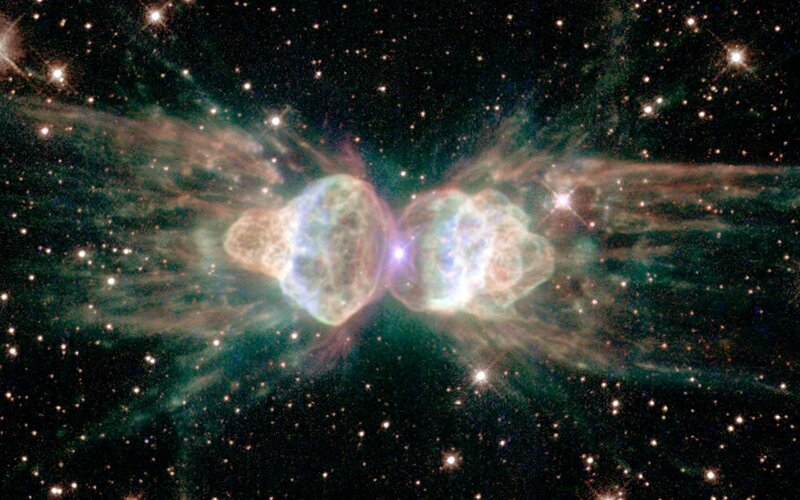 The questions this necessarily leads to are, was the universe born with such an imbalance? Were their equal amounts of matter and antimatter, and did matter some how annihilate more antimatter? Russian physicist Andrei Sakharov took to the drawing board back in 1967 to figure this out. For there to be more matter than anti-matter, he postulated that three conditions are needed. First, he argued that no conservation law can forbid reactions that would effectively impact the delicate balance between particles and antiparticles. For this to be remotely viable, he theorized that the laws of physics may vary just a bit for matter and anti-matter counterparts. 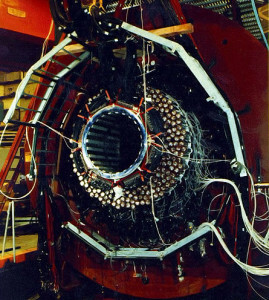 a house-sized detector at the Brookhaven National Laboratory that documented a rare mode of decay of particles called kaons, constituents of matter. Interestingly, this was a very bold claim, since no reactions have ever been conducted experimentally… that is, until particles called ‘long-lived kaons‘ came into the picture. In the lab, it was revealed that the weak force (one of the four fundamental forces of nature put forth in the standard model of particle physics) doesn’t act equally for quarks and their counterparts, anti-quarks. Lastly, he theorized that very early on in the universe’s life, various reactions between different particles and their antiparticle counterparts started taking place at much different rates among the radiation and the hot primordial plasma that was found the early universe. This would only be possible if they were not in thermal equilibrium. 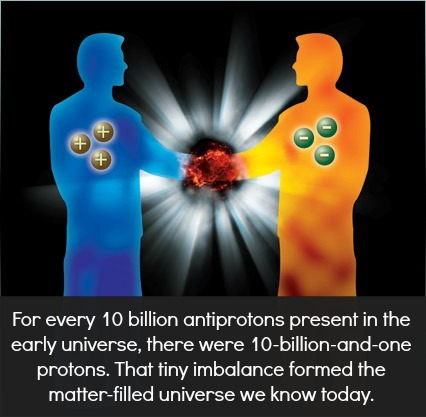 If they were in equilibrium, the universe’s highly imbalanced state would not persist and both equal parts of matter and antimatter would remain, cancelling each other out. Almost 50 years later, much of Sakharov’s conditions are still relevant, as the standard models of cosmology and particle physics (along with the simulations done using particle accelerators) have helped us understand the condition of the universe shortly after the big bang occurred, suggesting that within the first 10-12 seconds of the modern universe’s existence, particle interactions were much different than the ones we see today. Particularly, they were much more active, as most particles remained massless. This persisted until the universe began to rapidly expand and gradually cool, allowing particles to gain mass (by interacting with the higgs field) and switching to a more favorable lower-energy state. Particle accelerators like the Large Hadron Collider and the Fermilad accelerator, which accelerates protons and antiprotons to speeds close to the speed of light before violently colliding with one another, seem to indicate that matter is more prevalent than antimatter only about 1% of the time. This is a small number, but still significant, and it could explain normal matter’s dominance throughout the universe.